Do pigs dream of escaping domestic drudgery and letting their inner diva run free? Can porcupines rock their inner Chrissy Amphlett every chance they get? And is it possible for the son of gorilla career criminal to ever been anything more than a deeply-reluctant getaway driver? 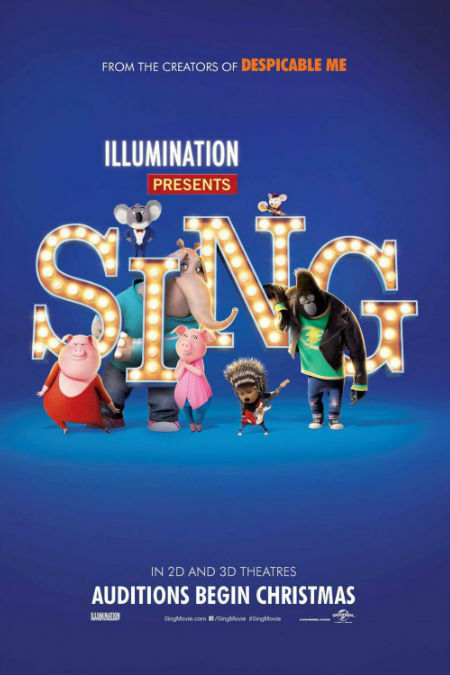 If these and many other anthropomorphic musings have ever crossed your mind, then Illumination’s Sing, a cross between The Voice and a vaudevillian talent contest, comes loaded with plenty of answers. Granted none of which will challenge or delight you in quite the same way as the thoughtful insights provided by Zootopia and Moana, both of which were standout animation features in an extraordinary year for the genre, but which come loaded with the a giddy musicality that will have you leaving the cinema with a big grin on your face. Cleverly, Garth Jennings, who wrote and directed Sing, loads the films with a gamut of songs that span the decades from Irving Berlin (“Let’s Face the Music and Dance”) to Lennon/McCartney (“Golden Slumbers”/”Carry That Weight”) to Taylor Swift’s ” Shake It Off” and give the movie a groove its narrative sometimes fails to muster. That’s not to say it’s not a delightful storyline – it’s well nigh impossible not to root for the likes of Rosita the Pig (Reese Witherspoon), mother to 25 piglets and wife to a disinterested workaholic husband and Meena (Tori Kelly), shy teenage elephant with a yearning for singing but not the nerves to carry her confidently onto the stage. But it’s hardly desperately original, with the talent quest announced by struggling theatre owner and sweetly-persuasive huckster Buster Moon (Matthew McConnaughey) in a bid to keep his theatrical impresarios ambitions alive, is something we’ve seen a thousand times before. Still, a slow middle section aside when the individual struggles of each of the animal contestants in Buster’s singing contest come to the fore in a bid to help us understand how big and indeed necessary their dreams are, Sing takes a well-worn concept and gives its some giddy joie de vivre that will have you wishing every single one of them can walk away with the prize (mistakenly listed as $100,000 after Buster’s aged secretary Mrs Crawly, played to absolute dithering perfection by Jennifer Saunders, puts in two too many zeros). Of course, nothing quite goes to plan with the original American Idol-esque whittling down to one triumphant singer giving away to a musical talent show from which you could well argue everyone realises their own dream of artistic fulfilment if not fame, as well some relational reconnections that make all the trials and tribulations of the lead-up to the show all worthwhile. If that all sounds quite adult in concept, then it is; Jennings invests the narrative of the film, which comes in at a hefty 110 minutes which may test the attention spans of some children, with some deep existential angst, of the kind that children won’t identify with but which many of their accompanying adults will find themselves nodding in agreement with, perhaps wishing they had some avenue to realise their long-dormant dreams. Take Rosita for instance. A talented singer with a mean sense of rhythm – one scene in the film has her dancing up a storm in a supermarket to the Gypsy King’s “Bamboleo” to the rapt appreciation of the one employee on duty – she is a devoted wife and mother who finds herself rediscovering a yearning for music that she had long since put aside. Happily subsuming her own dreams and ambitions to that of her family, she discovers that she wants more, much more, when Buster’s flier slaps itself against her kitchen window when she’s trotter deep in washing up. Other characters have a similar story – Ash (Scarlett Johansson) yearns to be the singer/songwriter rock chick her musician boyfriend won’t full allow her to express, Johnny (Taron Egerton), who sings sublimely, believes he has it in himself to be more than a member of his father’s gang, and even diminutive busker mice Mike (Seth MacFarlane), criminally minded though he is at times, is a big old softy underneath all that manipulative bravado. Alongside all this deeply serious thwarted ambitions are the big splashy musical numbers, visual gags and yes even fart jokes – it may not sound sophisticated and alongside the likes of Zootopia it probably isn’t, but it left a cinema full of young children laughing like fiends – that the trailer suggests will be present and accounted for. Sing is a defier of its trailer in many ways, investing a cute sweet realisation of musical dreams for a bunch of appealing anthropomorphic animals with way more gravitas and emotional meaning that you might expect. And that, alongside the musical numbers which dazzle and impress in equal measure, is the making of Sing. It may not be especially original nor daring in its animation ambitions – in stark contrast to the characters who give it vivacity, depth and a sense of appealing fun – but it is well-rounded and impacting, all too aware that pretty much everyone has dreamy big and not quite made it. Sure that won’t apply to the kids who watch it – they’re well catered for with fun songs and epic song-and-dance numbers that will leave them entranced – but it will to the many adults who will go the movies with them, all of whom will wish they had a Buster Moon in their life, and a stage, all the world aside, upon which to strut their long-sublimated stuff.